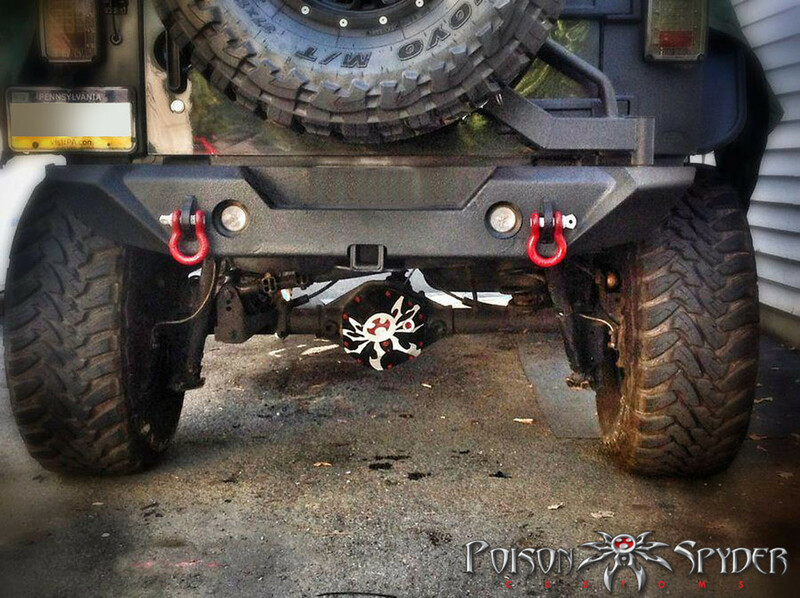 NEWLY RE-DESIGNED to accommodate ALL applications including STOCK Jeep Wrangler JK’s and TJ’s without suspension modifications! 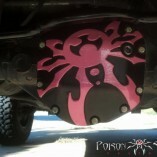 Poison Spyder Bombshell™ Diff Covers are designed to protect your gears, lockers and diff cover bolts from the most punishing rocks and trail hazards. 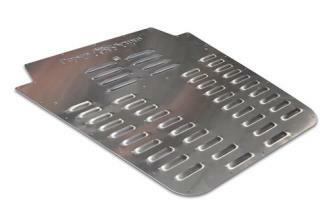 The stock covers your Jeep came with are weak, stamped sheetmetal. 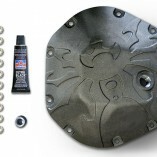 Even a moderate tap with a rock can cave it in against your ring gear, causing potential damage to the gears, locker and carrier bearings, not to mention a difficult, messy trail fix. 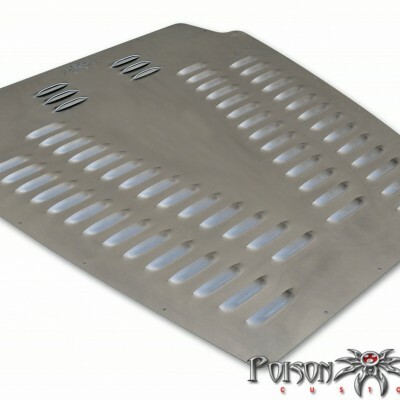 Even more common, though less catastrophic, is “peel back” that can occur when sliding over a rock causes the lip of the cover to peel up, allowing your gear oil to drain causing a hazard for both your Jeep and the environment. 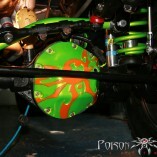 The Bombshell™ Diff Cover is your best insurance against each of these hazards. NEW! The Dana 44 Bombshell can now be used on STOCK Jeep Wrangler JK and TJ, front or rear axles, with no requirement for aftermarket track bars or suspension modifications! 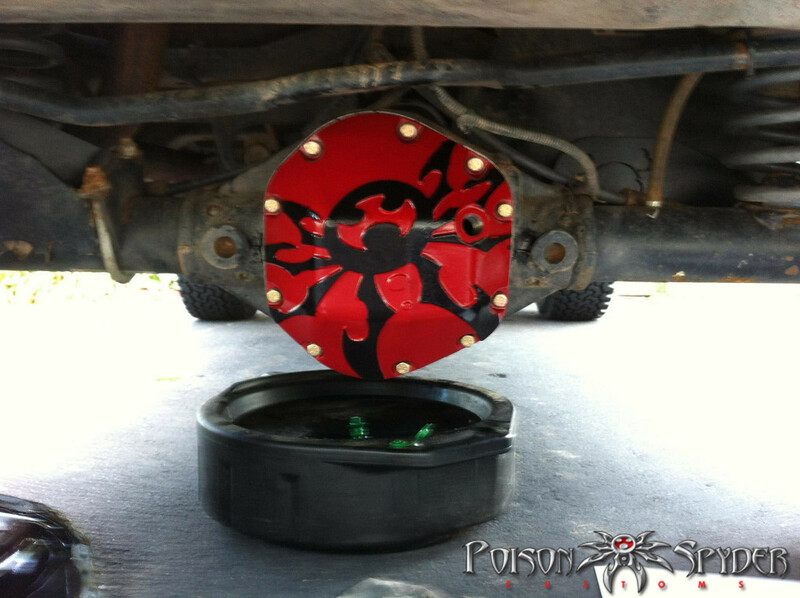 Now you can install the Bombshell Dana 44 Diff Cover on to your bone stock Jeep, straight off the showroom floor! This re-design also includes moving the gear oil fill hole to the stock fluid level height so there’s no more research, guesswork or measuring—simply fill the diff to the level of the fill hole. 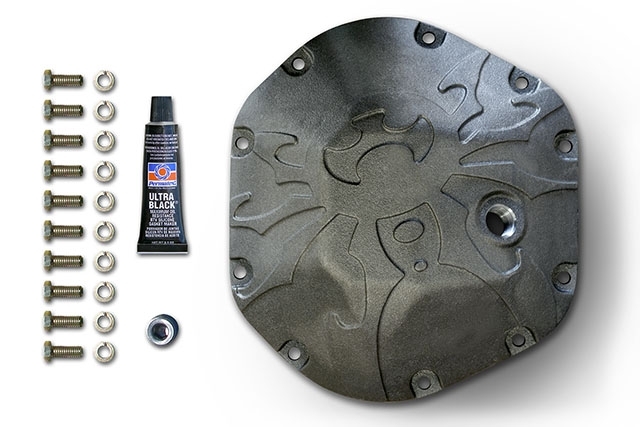 The Dana 44 Bombshell™ differential cover is cast from highly ductile nodular iron—the same material drag racing differential housings are cast from to handle thousands of horsepower. 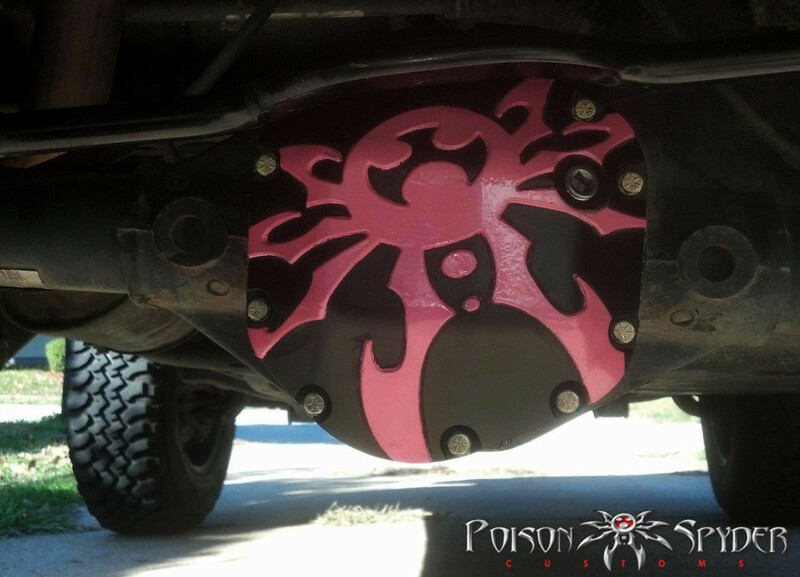 The design of the Bombshell™ incorporates recesses to protect the diff cover bolt heads from trail damage, while the profile of the Bombshell™ acts as a ramp to help slide your Jeep up and over the most troublesome pumpkin-eaters. The ramp profile also results in an extremely thick& up to 1″ thick—cross-section around the bolt ring, where contact with the rocks is most likely. 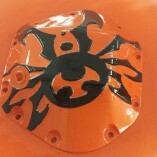 Throughout the rest of its cross-section the Bombshell™ is the thickest cast differential cover on the market, from 7/16″ to a brutal 1/2″ thick at the outermost surface. Installing the Bombshell™ is fast and easy. 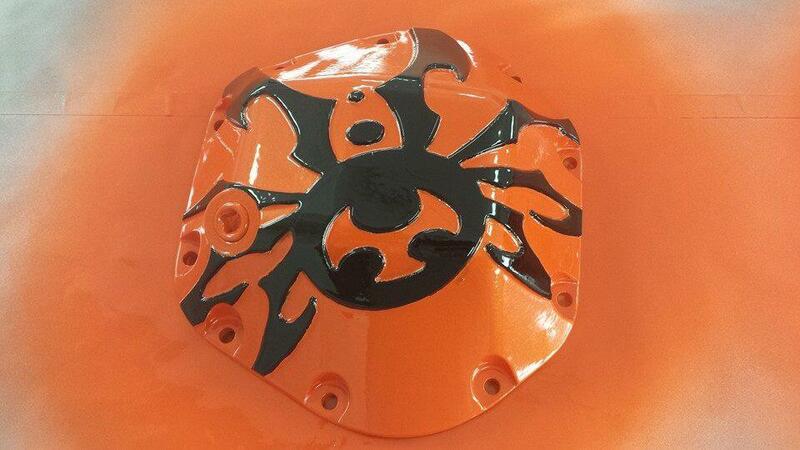 The sealing surface has been CNC machined flat for a perfect seal. 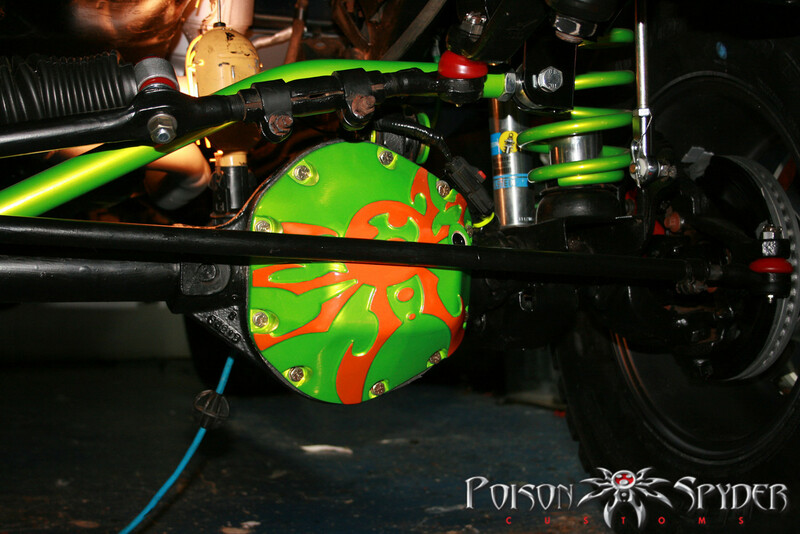 Poison Spyder provides a tube of silicon sealant and new Grade 8 hardware so you’ll have everything you need except for tools and gear oil. 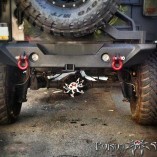 IMPORTANT FITMENT INFORMATION: On Jeep JK Rubicons with the stock front track bar (and all JK’s with the stock rear track bar), the Dana 44 Bombshell may make contact with the track bar at full compression of the suspension. 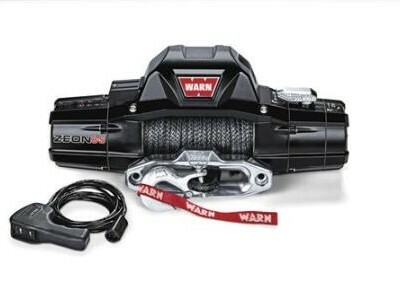 For this reason, the Dana 44 Bombshell is NOT recommended for use on the front Dana 44 of a Jeep JK Rubicon with the stock track bar, or on any Jeep JK with the stock rear track bar. Please see the FAQ section below for more information.